On 26 January, 2001, an earthquake of magnitude 7.9 hit Gujarat, India, killing over 25,000 people. Mansukhbhai Prajapati, a rural potter, escaped with his life but lost all his stock. All around him were people like him, coping with devastating loss and enormous practical problems. So he set out to help them in his way: he designed a fridge that would keep food fresh without electricity, using the only resource available to him – the clay with which he made pots. One of Prajapati’s small, squat fridges – the Mitti Cool – sits in the corner of Professor Jaideep Prabhu’s high-ceilinged, light-filled office at the Cambridge Judge Business School (CJBS). No wires run out of the back: fill the top with water and it keeps the contents cool by the natural process of evaporation. Professor Prabhu’s journey of discovery began, naturally, in India, where he grew up. That India was very different from the one that the world now knows. “Everything was centrally planned,” he remembers. “The state was all-powerful. We were more or less equal, but equally poor, so we instinctively understood the importance of being frugal. In those days, you either became a doctor or an engineer, and that was your ticket out of India. I studied to be an engineer.” He left in 1989, along with most of his graduating class, switching from Engineering to Business and studying for a PhD in Marketing at the University of Southern California. Shortly after Professor Prabhu’s departure, India changed. The then finance minister Manmohan Singh (a Cambridge alumnus) scrapped hundreds of rules and regulations that governed how businesses could operate, with the aim of growing India’s economy. Younger people still left India, but now their ultimate aim was to go back. Indian businesses such as Tata went global. Western companies came to India not just to set up back office operations but also to do research and development. Up to this point, Professor Prabhu’s main interest had been innovation in western corporations. The received wisdom was that this was where innovation happened: with big budgets and massive research and development teams pushing the tech frontier. 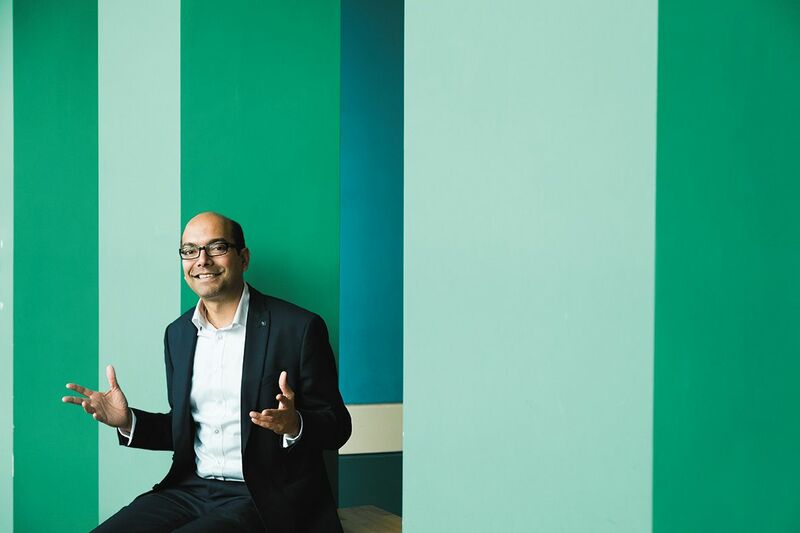 Now he had the opportunity to study innovation in India – and he soon realised that the Indian approach was vastly different from corporate innovation in the west. The Raspberry Pi, Professor Prabhu points out, is a superb example of a jugaad innovation. Developed by a team of Cambridge computer scientists, the £30 Pi is a highly affordable solution for budding engineers looking to gain hands-on experience by tinkering with computers and coding for them. The sharing economy typified by companies such as Airbnb is another example of frugal innovation in the west. “In the west, people are positively empowered to do more with less,” he says. “These pro-sumers – people who are more actively involved in the economic process – are driving things such as the sharing economy, where we can directly trade spare assets with each other on a digital platform.” Makerspaces are another example: places where “makers” can try out equipment, learn skills like coding, and swap ideas, experiences and expertise. But in the west, many people are choosing to innovate frugally. Growth must happen to maintain the west’s economic system, but it can’t be done on the back of resource depletion, Professor Prabhu says. People know this. They want to make the world a better place, and leave it a better place, too. “I truly believe that we need this way of thinking in both the developing and the developed world, and I think we’re headed to a place where the two will meet in interesting, creative ways.” The future’s bright: the future’s frugal. Catch Professor Jaideep Prabhu at the Hay Festival on the 26 May 2018 where he will be speaking on: Frugal Innovation – how the globe is learning to do more (and better) with less.